"Alaska, 1885. Colonel Allen Forrester receives the commission of a lifetime when he is charged to navigate Alaska's hitherto impassable Wolverine River, with only a small group of men. The Wolverine is the key to opening up Alaska and its huge reserves of gold to the outside world, but previous attempts have ended in tragedy. For Forrester, the decision to accept this mission is even more difficult, as he is only recently married to Sophie, the wife he had perhaps never expected to find. Sophie is pregnant with their first child, and does not relish the prospect of a year in a military barracks while her husband embarks upon the journey of a lifetime. She has genuine cause to worry about her pregnancy, and it is with deep uncertainty about what their future holds that she and her husband part." Inspired by the real-life journey into Alaska led by Lieutenant Henty T. Allen in 1885, Eowyn Ivey’s second novel To The Bright Edge of the World is different to her first, The Snow Child. It is grander. Darker. More adventurous. It is, however, just as beautiful. 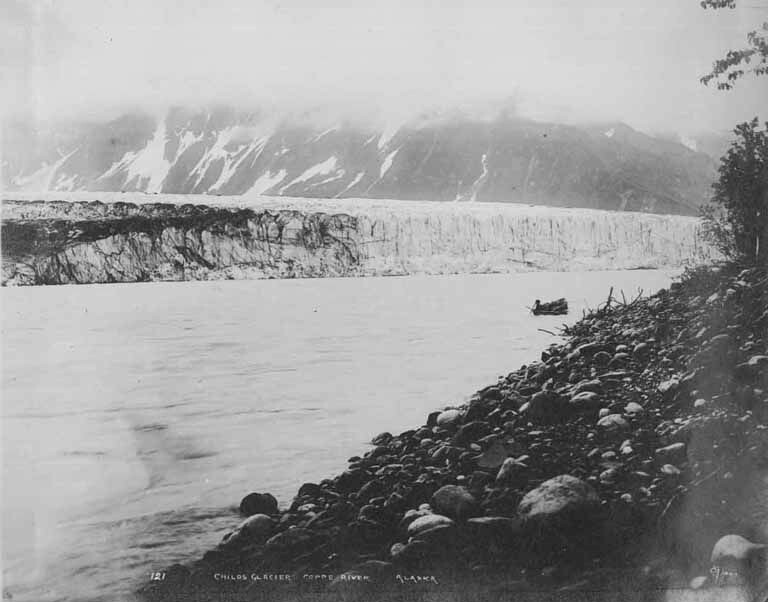 Child's Glacier on the Copper River, Alaska, ca 1908. I first fell in love with tales of the American frontier and wilderness when I was 11, watching the film The Last of the Mohicans for the first time. To this day it remains my favourite film, not only because it began my interest in American history, historical fiction, and all things epic, but because it has an energy to it, a sense of place, that is difficult to describe. It has something to do with the landscape, and attention to historical detail, but it’s something more, too. A homage to a time and place now gone, perhaps; a salute to the way the world used to be, in all its raw and wild purity. On a more technical note To The Bright Edge of the World is an epistolary novel; that is, it is written entirely in the form of letters, journals, diaries and reports. I admit this gave me pause, at first; I thought this format might cause distance between me, the reader, and the characters, and create limitations in description, dialogue and the 'shape' of the story. But I was wrong. To Ivey's credit, the sense of place and character - even the rhythms and nuances of dialogue - is not lost. Rather, they are enhanced. One can hear the roar of the Wolverine River and the crack and plunge of glaciers as they calve, feel the cold of the snow and icy water, and taste tallow and hard tack. My stomach clenched in sympathy when the Colonel’s supplies dwindled, and I felt as though I were there with him and his men as they struggled on beneath the careless mountains and the impassive sky. Even more impressive is the fact that we are given the points of view of not one, but several, characters, each with their own unique voice. Ivey has woven them seamlessly together, adding real articles, drawings and photographs from the period, so that I felt as though I were privy to a real, and fascinating, history. Like The Snow Child, there are strands of magic and mystery, though this time they are definitely darker and more primeval. Men and women turn into birds and animals. Strange fogs deliver beautiful women, and terrifying, otherworldly storms ravage lonely mountains. The reader walks always between logic and magic, one step in myth, the other in reality, as though the fabric separating the two might be easily pulled away, revealing a world of mysticism and superstition. To the Bright Edge of the World blew a cold breath into my heart. The landscape – its wildness and its history and its beauty – intrigued me; as I read I felt the relentless pull that urged the Colonel and his men northwards into unexplored territory. Gladly I went with them, drawn on by a combination of curiosity, fear and dread, turning the pages faster as they raced against weather, starvation and harsh conditions. Eager, like Sophie, to see such grand wilderness.